After using trades in the first few rounds to fix up ‘mistakes’ or cover for injuries it is now time to refine our Bye planning. Bye Planning isn’t the horror it once was. With the best 18 system and lots of trades in AFL Fantasy most players should be able to get through it OK. I am amazed at the amount of sideways trading going on as I read through the posts on this site. So hopefully people are improving their Bye position as they are going. Or maybe not! Anyway there are 7 more rounds of trading before the Byes so there is enough time to get your team Bye ready. 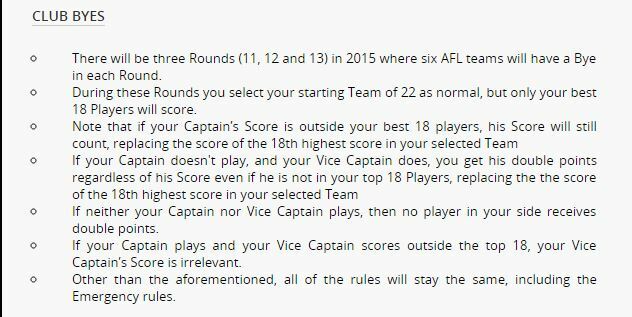 Simple enough, get at least 18 players onto the ground each Bye round and select a captain, vice and emergencies. In my view it is best to aim for an even spread – i.e. 10 : 10 : 10. That is 10 players with a Bye in each round, an even spread across line positions, and premiums players spread across all the rounds as well. A 10:10:10 strategy gives you a 20:20:20 outcome – that is 20 players available to play each round, of which your best 18 scores count. An even spread across line positions means you can get all your players onto the ground with a shot a getting a ‘best 18’ score. In the past coaches have tried to front load players – say a 9:10:11 strategy. But I think this is too risky – weird sh*t happens in the Bye rounds. Give a team’s players one week off and some treat it as an opportunity to take a couple off to fix some nagging injury. You still need some trades to cope with normal injuries and suspensions during the Byes; so you simply don’t have enough trades to reform your team structure once the Byes start. Try to avoid an elaborate Bye strategy that is too dependent on fancy DPP switches, or a few fringe players suddenly being selected for a particular Bye round. The Fantasy Gods, AFL Coaches and Match Review Panel love thwarting your complex long range Bye plans. Risky stuff might be OK if it is going from 19 to 20 players available, but not if you need it to go from 16 to 18 players available in a round. However, Bye planning is a secondary consideration. You should still maximise your scoring up to the Bye rounds. Don’t carry a dud player for 5 weeks just because you need him for a Bye round (is that a Shaw or Lamumba I see lurking in your team?). Try to find a better option to set up your team for the Byes. The first thing to do is understand your current Bye position. Forget about those coloured dots and bye counting websites, they don’t tell you what you want to know – i.e. which of your players might get on the ground in each Bye round and how much you are likely to score. The file below is what you need. This will show you what your team is likely to look like and score during each of the bye rounds. It is a an Excel spreadsheet, but it is designed to run in google docs as a google sheet. You do not need excel software to run it. The file is a lot simpler this year to allow it to run in web browsers as a google sheet and so more people are able to use it. 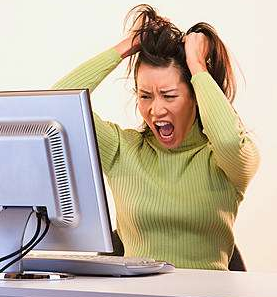 Excel: Open the file in Microsoft Excel if you have it and prefer to use that software. (note the file was created in google sheets so it looks better there than in excel). Google Sheets: If you are a google docs user – upload the file to your google drive. Find the file in your Drive, right click, then select open with >> google sheets. It is important to open it as a google sheet otherwise the formulas will not be live. (If you are not a google docs user it is free to open a google drive account and use their online spreadsheet software). Read the Instructions tab sheet in the file for details on how to use the Planner. Put your team in the green cells and the software will put all your players into the right spots for each Bye round. You will see my team in the file when you load it. At present I have too many players available in Bye round 13 (24 players), and I can’t get them all onto the field. Conversely in Bye round 11, I only have 17 players available and a poor forecast score of 1,438 points for that Bye round. So I still have a bit of work to do. The table at right shows my current Bye breakup. The spread is 12:12:6 – which is some distance from 10:10:10. As a further complication, in round 13 I don’t have any defenders or rucks with byes, and I only have 1 premium player who has a round 13 Bye. (Premos are the higher scoring top 50% of my players in any line position). As a guide I think 1,650 to 1,700 points per round was about par for the 3 bye rounds last year. It isn’t immediately obvious what trades I need to make to improve the situation. However, if you scroll down the planner you will find this table (on the right). This suggests some trades to get a more balanced spread. The pink shading is where I need to trade out a a player, the green shading is where I need to trade in a player. Trade out a R11 or R12 non-premo, and bring in a R13 non-premo. Trade out a R12 bye premo, and bring in a R13 bye premo. Trade out a R11 bye non-premo, and bring in a R12 bye non-premo. Trade out a R12 bye non-premo, and bring in a R13 playing Ruck (a mid level ruck). Trade out a R13 bye non-premo, and bring in a R12 bye non-premo. Over the next 6 weeks there will be a lot of upgrade / downgrade trades as the first wave of rookies hit their cash ceiling. The trick is to try and get some of these Bye trades or their equivalents done at the same time. When there is a choice of similar trade candidates, I’ll try to pick the one that matches my Bye needs. It is never going to be perfect. None of the numbers of players in any line position is divisible by 3 so perfect balance is mathematically impossible. However, moving towards a well balanced team in the lead up is the best way to avoid falling victim to the random tempests that the Fantasy Gods will hurl down during the Bye rounds. You will be able to sail on through, while your rivals get shipwrecked or scuttle their own team with bizarre trades just to get players onto the ground. Need to fix this in my trades the next 5 weeks. Eek. Just checked mine and its 12/12/6. This might have to change…..
You might be able to use this if the Bye rules are the same. I don’t do RDT so I don’t know. But if anyone is doing both and knows if the rules are the same or not it would be useful to know. People playing both might be able to create a separate copy of the file for each game. No worries, glad you like it. Still plenty of time to get a decent bye side together. Nix this is brilliant mate. Just what I needed. Gee, I’m not sure if this has helped me or just made me realise I need to fix up my bye structure. So what does that mean…. I’ll have 15, 21, 25. Need to trade out some round 11 bye players. Yes, but better to find out now, than in 5 weeks time. Don’t panic. You probably have Hunt, McIntosh, CEY and Honeychurch as R11 byes. These will all have maxed out and will probably be traded by the time the byes come – just don’t get more R11 byes players when you trade them. I don’t think I can do much to help. No-one else has reported any probs, so it seems to be working for everyone else. Are you using it in Excel or Google sheets? What exact cell references are the errors in? The most likely explanation is that you have deleted some formula or entered data wrongly in the green sections. I suggest you start again and download a clean file. Who do we think is the better trade in option, Tarrant or Mcinnes for Clark. I know tarrant has better job security but could you still make more money off him at his price then Mcinnes?